AOL Backup is designed to save all AOL emails to hard drive without any difficulty. Each mail folder is considered when start downloading all such items i.e. inbox, sent items, trash or any other custom folder to be saved on the source machine. The software also creates the backup of AOL conversation on the hard drive or another storage device. AOL Mail backup provides a variety of options to save all email messages on the local machine. It provides multiple file formats in which the users can export AOL mails as per their need. In order, the tool has no limit for the usage of emails backup, storing all files in multiple file formats. Once a backup file is created on the hard drive and offers an option to erase downloaded mails from the AOL server. However, this feature is only applicable on all the emails and helps to cut down its storage on the server. 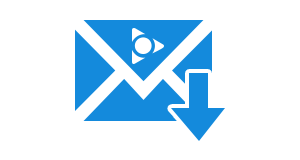 This utility provides a pause or resume option or specifying the percentage of bandwidth consumed while downloading mails from the server. The software is capable to download all emails from AOL account from the server without any kind of data loss. Additionally, the AOL backup tool offers an option to save all credentials which allow to remember the account credentials. 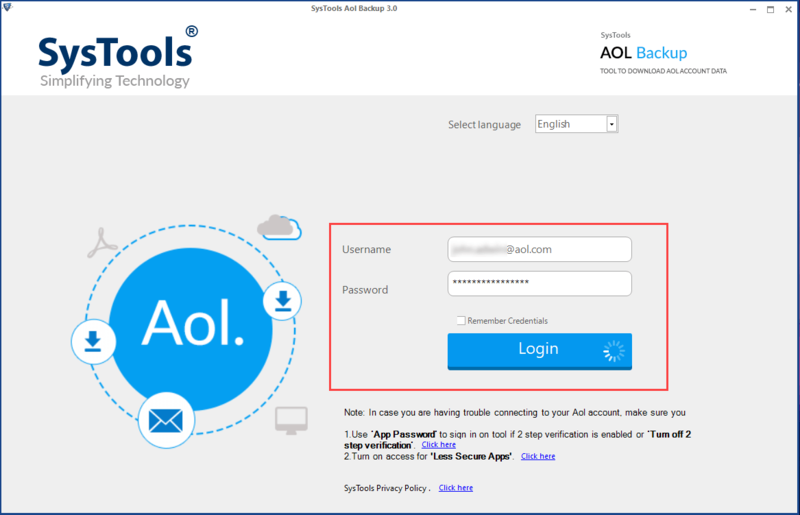 Although, the users can save selective emails from AOL account locally with help of this utility. Moreover, the will maintain all the metadata properties, attachments of emails, etc, and all will remain same. 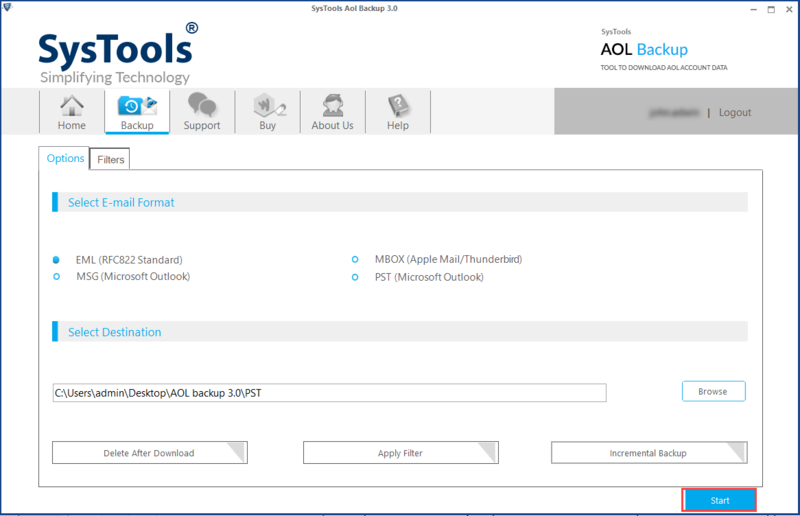 The AOL Mail backup which can hold the original folder structure of AOL profile. Through its incredible features, one can easily save data locally on the machine without wasting their efforts and time. While downloading there is no restriction on the number of data items to be downloaded at a time because of software downloads entire data simultaneously. 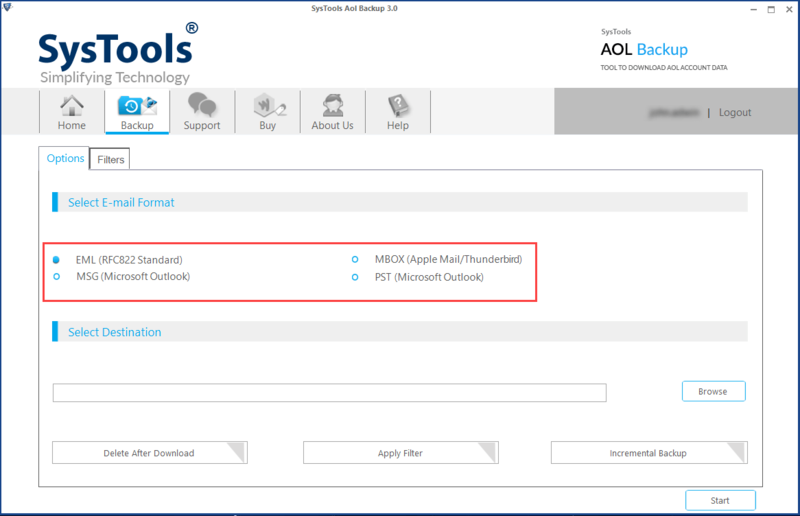 AOL Mail Backup software has two types of filters means to export selected email messages. The users can either choose the selective file or folders for exporting or setting the date range of 'From' and 'To' to specify the set of multiple emails to be downloaded. Also, it provides an option to change User Interface in the preferred language. Is it necessary to share all required credentials using AOL backup tool for creating the Mail Backup of AOL account? 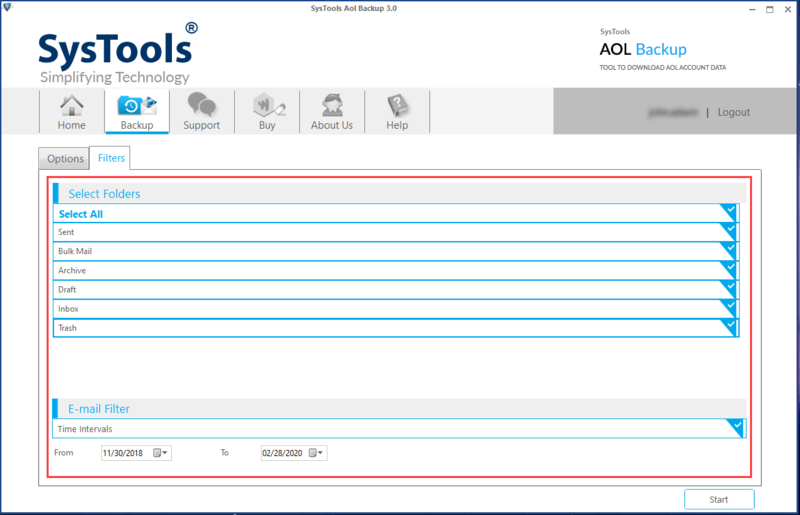 Yes, it is mandatory to fill credential details while logging the page of AOL Backup wizard. Until and unless, the users will unable to share the account credentials then, the how can this software be able to take the backup of AOL account data. Does the AOL backup tool provide security for creating the backup of personal emails if they are exported once? Yes, of course, the stool offers “delete after download” feature that allows the users to remove backed up emails from the AOL mail account. With your product, can I save my AOL emails to the hard drive? Yes, it can be possible to save each mail from AOL account to flash drive or hard disk of any system with the AOL backup software. What are all pre-requisites required for running this AOL backup application? Apart from Windows configured machine, there is no requirement of any prerequisites to work with our product. First, you have to download & Install AOL email backup software locally. Then, enter the required Credentials i.e. email address and password. After that, click the Login button. Now, select the preferred file format in which you want to migrate AOL File data. Next, Click Browse that you can choose for saving AOL emails to the desired location. After this, the software will display the live backup process of AOL mail account. Finally, you will get the notification message "download completed successfully" on the screen. Press OK button. "The major aspect I really like about this software is that it supports various file formats. SoftwarePro AOL email backup tool is just one-time investment tool for creating the backup of AOL mails in any of the desired file types. After deep researching, I found this one of the best and very useful product for professional users." "AOL Backup Software developers has seriously built an amazing product to save all AOL mail folders to computer hard drive. I really appreciate the hard work of the software development team for initiating a wonderful software. The best part is its fast performance and working through which this product works. Thank you!". "Earlier I have faced various issues when I used other applications for creating the backup of AOL mail account. But, when I came across this AOL Backup tool no such compliance trouble was faced by me and I was able to migrate AOL mails to new computer easily. ".